Blog about greatest games of the past and how it feels like to play them the first time. It must first be said that Toy Commander has managed to take the one true concept of imaginative gaming, a youth and his toys, and weave all the elements of childhood playing into the most innovative game for the Dreamcast. If you can remember being a kid, then I've no doubt that you have fond memories of playing with your toys in clever fashion and only as you could imagine. This is what toy commander offers you, the chance to be a kid again. You are Andy Guthy, and imaginative boy with lots of toys. One of your toys, Huggy Bear, feels neglected and has revolted along with several other old toys, to demolish the new toys that you so currently love. Sounds childish right? Don't let this discourage you, everyone, regardless of age should give this title a try. And so it stands that the toys have given you certain objectives or missions, if you will, that you must accomplish in order to become master of your toys again. What awaits is a game so enriched with gameplay, that you'll never want to put this one down. The bright level graphics are of such high quality that I actually had to tone down my TV a bit. That's right folks, the graphics in Toy Commander deliver a sense of atmosphere like no other title. Your in your house, after all, playing with your toys. No rooms are off limits as you will find yourself in every room of the house imaginable. Everywhere from the kitchen to the attic, is well represented, with high detail, and nothing seems to be missing. You take control of a wide range of vehicles, including cars, trucks, planes, and boats. You may have trouble controlling the airplanes at first, but like most good games, it's an acquired skill. You control your vehicle with the stick. Weapons are at your disposal, with high powered machine guns and missiles for long range and power attacks. With time, the control becomes second nature. Each mission contains several objectives. Within these missions you will find yourself switching vehicles at different times to complete all the objectives. Although most levels offer you a substantial amount of time, some levels require you to move quickly and finish within a certain time frame. Eventually, you will have to best one of your rival toys times on each level if you want to truly finish this game. Pump up the tunes, cause they jam. There are quite a few different themes in Toy Commander and what sets this game apart is the fact that instead of a set tune for each level, players are subjected to a medley of fine quality music. The tunes intensify at just the right time and really add a sense of style to the differing levels. The sound effects are decent, if a little lacking at times. This game is not for children, no way. The difficulty is above and beyond the call of duty for even the most accomplished player. This game will take up a lot of your time, so if you like playing other games then stay away from this one until your schedule is more free. Of course, you could convince your friends to play this title and experience the best multiplayer game yet released for the 128-bit powerhouse. Personally, I have never experienced such multiplayer joy on the Dreamcast. 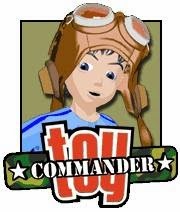 Only Goldeneye or THQ wrestling games can compare to the amount of fun to be had in Toy Commander. The deathmatch mode in Toy Commander is unbelievably addictive. Just set the number of frags and tear through the house using any vehicle you choose. Every time you die, you will have the option of changing your vehicle, of which there are no less than 35. Imagine starting out a match with a high powered jet or airplane and then switching to a ground based attack vehicle. Now that's an option that never gets old. I can now call myself a veteran of Toy Commander's deathmatch and my friends and I usually start out in the air and end up in a fierce chase on the ground or on walls with tanks or jeeps, man the options are seemingly limitless. If for nothing else, pick up Toy Commander for the multiplayer alone. I have nothing bad to say about Toy Commander, I find the game to be the most enjoyable Dreamcast title developed. Fifty missions with multiple objectives, fully rendered 3-d graphics and a host of options for 1-4 players, now that's what I call a game. As mentioned before, you'll spend a lot of time trying to complete this title, so if your not up to the challenge, then I suggest renting it first. If your the type of gamer who doesn't like to let a good title pass you by then Toy Commander is out there waiting for you.